History: While exploring some underground caves, geologist Scott Martin discovered strange, alien crystal formations. Breaking the lamp in his hard hat (and wishing that he had "brought that old lantern") he followed a source of light and found an underground city, powered by a huge crystal. He was captured as a spy and thrown into a dungeon with Zarkon, the deposed ruler of the city. His enemy Tyrnos deposed him when he gained fantastic powers by wearing a fragment of the Ko-Dan crystal on his crown. Using his geologists tools, Scott was easily able to escape from the dungeon. He defeated Tyrnos in a battle of willpower to control the crystal, which flew into the lamp holder in his hard hat. The grateful Zarkon let him keep the crystal as a reward, and Scott returned to the surface world as The Beacon. Scott did not keep his true identity a secret, and would aid anyone who needed him. He was financed by Texas oil millionaire, Aloysius "Oily" Boyd. After adventuring for some time, he met the Earth A Beacon for the first time. They discovered that their power crystals were identical. Comments: Thanks to Chris Adams for all the information used on this page. He notes "The Earth B Beacon has the same colour coded powers as his counterpart. He is a founder member of the Knights of Justice." 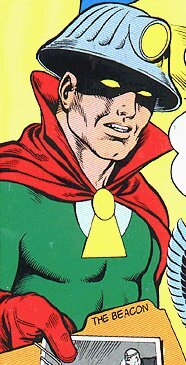 Vernon Sanders points out "His name, Scott Martin appears to be a combination of names Alan Scott the first DC comics Green Lantern and Martin Nodell the artist who first drew Green Lantern."